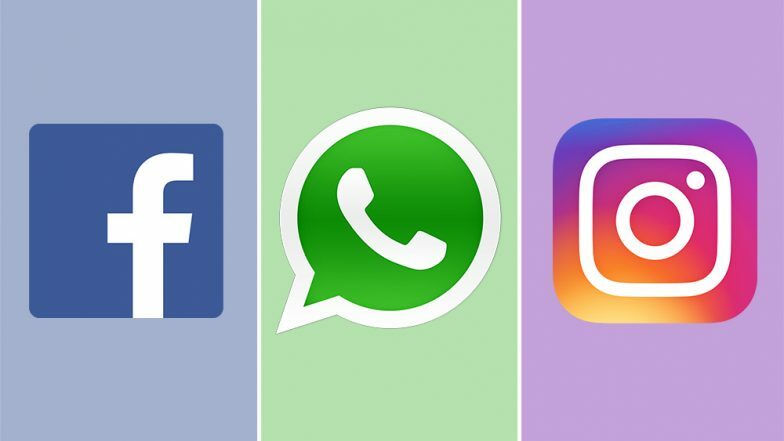 Users of Facebook, Instagram and WhatsApp faced outages in several parts of the world, with the three social media platforms turning inaccessible. Facebook, which is also the parent company of Instagram and WhatsApp, is yet to react to the latest blackout being faced by netizens in Europe, the United States, Middle East, Southeast Asia and Brazil. Facebook users who faced the outage claim that the main domain - facebook.com - is said to be unavailable on visiting the site. The app of Facebook Lite, along with Messenger - another application hosted by Facebook for chatting - also turned dysfunctional. Facebook Hit by Worst-Ever Outage Last Month. Instagram users also registered their complaints, stating that while the app is opening, the feed is not getting refreshed. WhatsApp users, meanwhile, have complained of a total outage, claiming that they are neither able to send nor receive messages. Reports claim that Facebook has received complaint from over 6,000 users worldwide, the majority of them being in the United Kingdom. Similarly, 4,000 Instagram and another 6,000 WhatsApp users have registered their complaints. The incident comes almost a month after the Facebook faced its worst-ever outage, with all the three entities - Facebook, Instagram and WhatsApp - turning inaccessible for European users for nearly 24 hours. The March 13 fiasco was attributed by the company to a "server configuration change".